Memphis Recording Service will release Limited Edition pressings of Elvis’ entire live concert performance recordings from 1954 – 1961 on 3 exclusive double LP vinyl’s, each with a 24-page gatefold, for Record Store Day on April 16th 2016. The titles are ‘LIVE IN THE 50’s - THE COMPLETE TOUR RECORDINGS’, ‘THE COMPLETE LOUISIANA HAYRIDE ARCHIVES 1954 – 1956’ and ‘SUCH A NIGHT IN PEARL HARBOR’ with all of the tracks remastered, they will be the best on vinyl for many years to come. Memphis Recording Service would like to reiterate that these releases are exclusive for Record Store Day retailers ONLY. If any leftovers the week after April 16th can only then, (under RSD rules) be available by your local Elvis dealer. 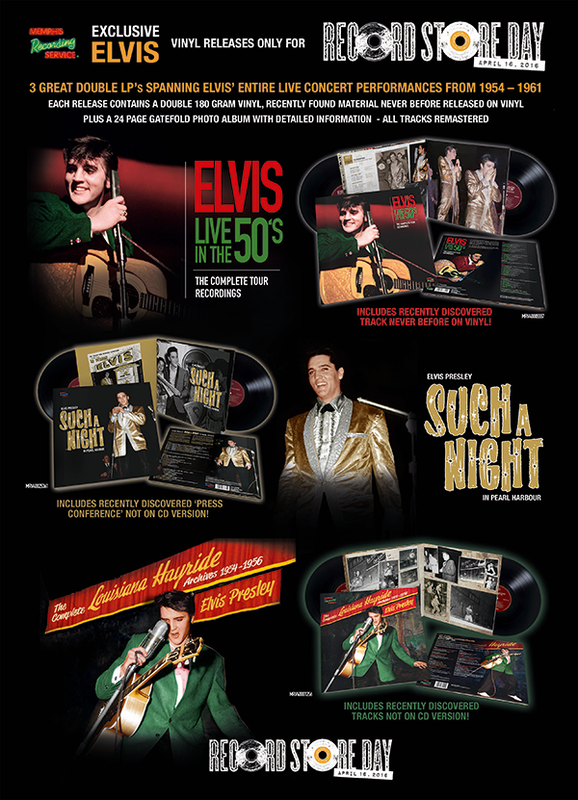 This LIMITED EDITION 180 gram 2LP set contains for the first time ever, the complete archival live tour recordings of the 1950’s by Elvis Presley. All of the 34 tracks are re-mastered using the most sophisticated technology and includes a bonus track of recently discovered material. The bonus 24 page gatefold photo album has many rare and unreleased photographs and every show listing in the 1950’s. This LIMITED EDITION 180 gram 2LP set contains for the first time ever, the complete archival live recordings of the Louisiana Hayride by Elvis Presley from 1954 – 1956 on vinyl. All of the 33 tracks herein are re-mastered using the most sophisticated technology and include recently discovered material, including a live version of ‘I Forgot to Remember to Forget’ and a brand new song ‘Little Mama’, released for the first time ever on vinyl. The bonus 24-page booklet has many rare and unreleased photographs. It contains extensive linear notes, with informative and historical facts on Elvis’s time with the Louisiana Hayride during 1954 - 1956. On March 25, 1961 Elvis Presley performed what would become his final live performance for eight years! The complete recording of that very show is captured here on this limited edition, 180gm, double album set. Also included in the 26 tracks is a vinyl debut of the recently discovered press conference for the show which was not available at the time of the CD version of this release. As a bonus, the included 24-page booklet is illustrated with many rare large images and extensive, informative linear notes that recall historical facts up to and including Elvis' arrival and performance in Pearl Harbor.